President Muhammadu Buhari has revealed why he is seeking to come back as Nigeria’s leader in 2019. 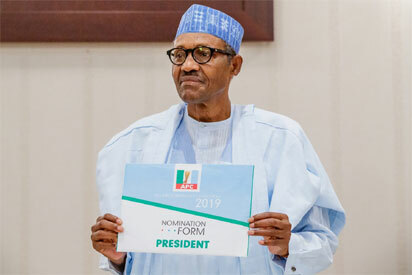 President Muhammadu Buhari Wednesday said that he decided to seek re-election to protect the interest of Nigeria, Vanguard reports. President Buhari who stated this when he submitted his Expression of Interest and Nomination Form at the All Progressives Congress, APC, Secretariat, Abuja, said that every hand must be on deck not to allow those that had held sway from 1999 to 2015 to come back to power. He expressed appreciations to the political group that purchased the form for N45.5 million for him. He said, “I am here in person among friends and colleagues to put my name forward to my party, the All Progressives Congress, seeking nomination to contest the Presidential Elections next year, 2019. “Fellow party members, I am taking this step with all humility, sense of responsibility and an unquestionable desire to serve and protect the interests of all Nigerians. “I am very grateful to those dozens of organizations who have joined together and contributed funds to purchase these forms. I assure them and the rest of Nigerians that, if nominated and if elected, I shall continue to serve you to the best of my ability. “Let me today appeal to party members not to be complacent but to prepare, strategize and win in 2019 elections. I commented that,president muhammadu buhari he will never come back as president in Nigeria again.